Happy Bloggers Challenge Friday! Thanks to those who played along with the Reuse/Recycle Challenge, the challenge this week Travel. The theme is open to your interpretation - you could use travel stamps/dies/cutting files, you could be traveling somewhere warm, bird stamps even fit the theme as they travel (yes that's a stretch on the challenge, but it works!). A sweet dear friend of mine unexpectedly lost her husband last week, this is the card I created to send to her. All stamps and custom dies are from Our Daily Bread Designs. 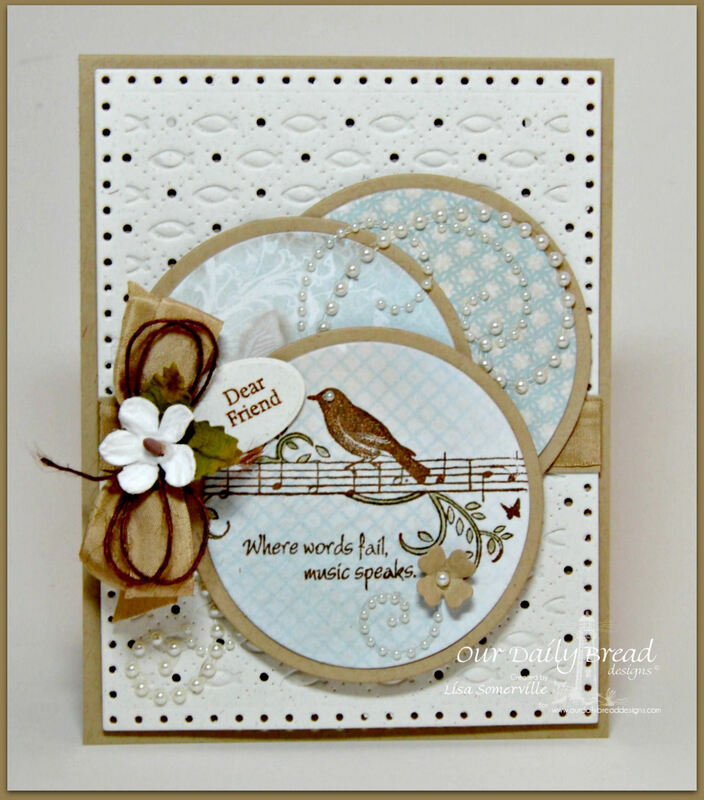 I used the Music Speaks stamp set to stamp the Bird/Music onto papers from the Shabby Rose Paper Collection (releasing soon from ODBD). I then used a SAMJ to add the sentiment. The pattern paper panels are cut using the Circle Ornaments Die, layering the pieces onto Kraft panels that were cut using the Matting Circles Dies. The large "debossed" panel was die cut using the Faithful Fish Pattern Die and Debossing Plate. To embellish I added Seam Binding, Zva Creative Crystal Gems, Flowers, Twine a die cut flower using the flower from the Ornamental Crosses Dies and a stamped/die cut tag using the Mini Tag Sentiments stamp set and Mini Tags Dies. If you would like to play along with this weeks Bloggers Challenge, please link back to this post on your blog and mention you created your card for the Bloggers Challenge Travel Challenge. Please add your link using the Link Tool below, your link should be a direct link to your Bloggers Challenge Post, use your name as the Title. Please do not link to cards that were created prior to the challenge date. Entries not linking properly, or backlinked will be removed. If you have the captcha enabled on your blog, please consider turning it off, as it makes it so much easier to leave comments. Gorgeous card for J.-I had a difficult time with one for her, but finally got it in the mail. I love the subtle colors on yours-very pretty. Beautiful card, very elegant and creative. Sorry for your friend's loss.